Cooling Peppermint Drink for Hot Weather-Make a weak peppermint tea using 1/2 oz. (12g) peppermint and 1 pint (500ml) water. Add the juice of 1 lemon. Cool in refrigerator. Add ice and a sprig of fresh mint. Drink freely to avoid the debilitating effects of heat (Avoid large doses in pregnancy). PAPAYA MINT: These chewable tablets nutritionally support the digestive system, but they can also be used as tasty breath mints. Papaya fruit contains an enzyme called papain that can break down protein, while peppermint leaves contain aromatic compounds that trigger the production of digestive fluids. Tablets contain papaya fruit, peppermint leaf, fructose and sorbitol. Chew 2 tablets with a meal three times daily, or use between meals as a breath freshener. 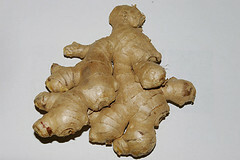 Ginger: One of the very best indigestion treatments! You can make a tea with powdered ginger or fresh ginger root. Or, take 1 capsule with a meal twice daily. ANGELICA: Used for colic, gas, heartburn, high blood pressure, and to increase circulation. Peppermint Oil: Great for indigestion, colic, wind, nausea, vomiting, depressed appetite, menstruation cramps, and gall bladder pain. Angelica Travel Oil - Add 5 drops of angelica, 5 drops of Melissa, 5 drops of peppermint, 5 drops of Ginger to a small dropper containing 1 fl. oz. (30ml.) of sweet almond oil. Massage a few drops in a clockwise direction around the abdomen to ease stomachaches. GASTRO HEALTH CONCENTRATE: This product inhibits the growth of the dangerous H. pylori bacteria. Soothes the stomach. Minimizes gastric irritation and discomfort. STOMACH COMFORT: A product which helps to protect the mucous lining of the esophagus, aid and promote digestion, and soothe the digestive tract. It contains calcium carbonate, alginic acid (from kelp), wintergreen oil, papaya fruit, slippery elm bark, licorice root concentrate and ginger rhizome. DIGESTIVE BITTERS TONIC: Contains DANDELION, GENTIAN, and CARDAMON. These bitter aperients herbs can be taken 20 minutes before food to improve the general tone of the digestive tract and boost immunity. 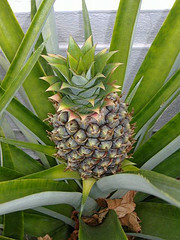 FRESH PINEAPPLE: Contains the enzyme, bromelin, which breaks down food and aids digestion. Eat a slice of fresh pineapple after meals to ease symptoms. FRESH DILL: Add to boiling water, steep, cool, and drink to reduce flatulence and gas pains. CLOVE TEA and CINNAMON TEA: . Soothes gas pains and nausea, particularly the nausea of travel sickness. Clove tea is warming and can encourage the body to sweat, which is helpful for high fevers and vomiting. CIDER VINEGAR: Drink warm with a little honey to treat digestive disorders and urinary infections. If you are pregnant, please consult your doctor before trying any natural remedy. View this page on some great natural remedies you can take when you are pregnant to relieve indigestion, morning sickness, heartburn, and nausea.